Originally from Germany in the 19th Century, the Weimaraner is a breed recognized by the American Kennel Club (AKC). This silver-gray coated pup is a loyal and loving dog. They have been bred for hunting large game and can be fierce guard dogs. 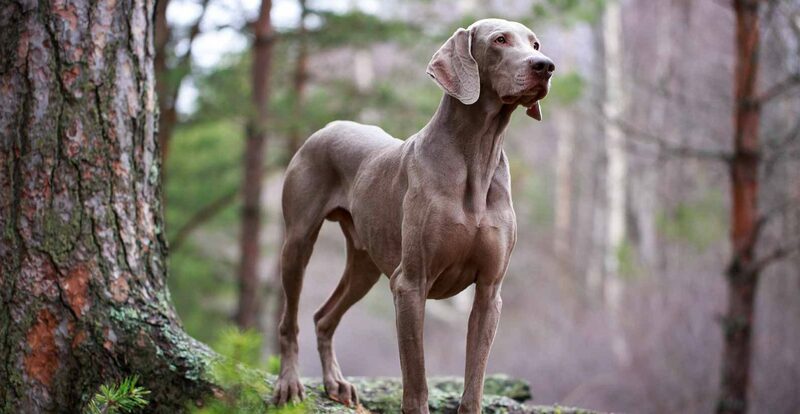 Weimaraners originally hunted boars, bears, and deer with royalty until hunting trends shifted. Then, they were used to hunt fowl, rabbits, and foxes. This dog breed is also a fantastic water dog because of their webbed paws and slick fur. This dog breed is an energetic hunting dog. They are strong and are always happy to exercise or hunt for days on end. Weimaraners have an intense prey drive, so they will not do well with cats or other small pets. They can also be prone to barking if not trained properly, which will not only scare small animals but also other pets. This pup is known as a “Velcro Dog” because they are extremely loyal and will never leave your side. These dogs can be prone to separation anxiety if left alone. If you can, always have someone at home with the dog or bring him with you. This people-oriented dog will be happy in an office setting or workshop. In case you have to leave your dog alone at home, you should offer mental stimulation such as food puzzles, toys, and calming noises. This will keep the pup from becoming destructive to themselves or property. A Weimaraner fits best if you have a growing family without other pets. They may be able to get along with another dog relative to their size, but be sure to introduce them before bringing them home. Because they are active, you will need to give your pup plenty of space inside as well as outside to romp, run, play, and explore. Weimaraners will be happy to go on family adventures with you and are surprisingly easy to travel with. Weimaraners are a generally healthy dog breed. They will need lots of exercise, a nourishing diet, and regular vet appointments to maintain optimal health. As these pups age, they are prone to gastric torsion, which is when the stomach twists and pinches blood vessels. It can lead to general distress, a swollen stomach, discomfort, no bowel movements, and even death if not surgically treated. Other than that, they are also prone to bloat, which can be treated by raising their feed dish and parsing out feedings throughout the day. Weimaraners have a low rate of dysplasia, but can fall ill from hypothyroidism, pituitary dwarfism, progressive retinal atrophy, and entropion. These dogs are fairly easy to train because they are intelligent and patient. However, if this is your first pet, you may want to hire a trainer to work with you. This is partly because they can become stubborn, are known to wander, and have a high prey drive. If you work with a trainer, you can work through these possible issues and gain confidence in your own training abilities. The Weimaraner has a silver-gray coat and short, smooth hair that requires minimal grooming. You should brush your dog weekly and bathe when necessary. After intense hikes, or swimming sessions, you will want to wash them off to avoid any mud or dirt being brought into your house. Because of their dangling ears, they can be prone to ear infections. You should check their ears weekly, then wipe them out using a gentle cleanser and cotton balls. Never use Q-tips in your dog’s ears and take him to your vet if there is any odor or discoloration in them. Brushing your dog’s teeth or using an enzyme toothpaste daily will help prevent cavities and gum disease. If possible, brush their teeth every day. Finally, Weimaraners need to have their nails trimmed twice a month. They also need their paws moisturized frequently to keep them healthy and comfortable. 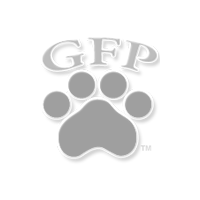 You can make your own paw balm at home or buy some to help keep their paw pads healthy. 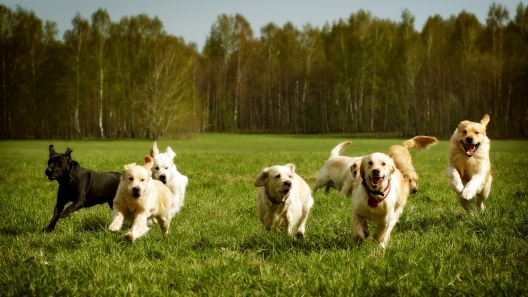 These dogs are high-energy and are always eager to play with their family. Because of their intense energy levels they need at least one hour of walking per day. They may also need trips to the lake or dog park multiple times a week. This will help your Weimaraner be a calmer and healthier dog overall. The Weimaraner stands 23 to 27 inches tall and weighs 55 to 80 pounds. The Weimaraner usually lives 11 to 13 years. The Weimaraner has been a favorite of Presidents and artists alike. President Eisenhower brought his Weimaraner, Heidi, with him the to White House and this dog breed was a favorite of artist William Wegman. They’ve even appeared on Sesame Street! With their fierce loyalty, Weimaraners certainly earn the title of "man's best friend". 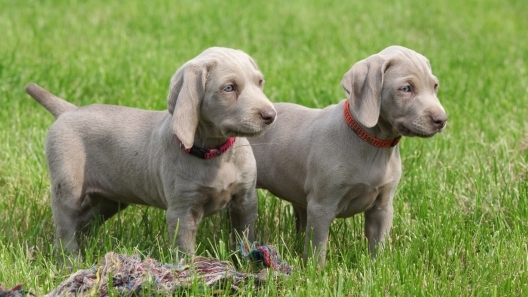 Here are 4 things to know about Weimaraner puppies. 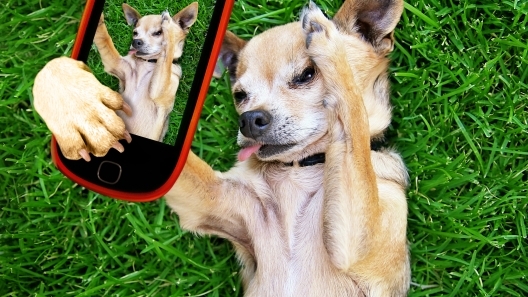 Finding cute dogs on Instagram can bring a smile to your face, even if you’re not a dog person. These are 6 famous dog accounts to follow on Instagram. The Weimaraner is a breed developed in 1800’s Germany, bred to hunt large game such as bear, boar, and deer. A man from Rhode Island brought over three of these pups, so that the United States would also have these intelligent, beautiful dogs. With their short, silvery-grey coat, they are sometimes referred to as the “grey ghost”. Other than their coat, another identifiable feature of the Weimaraner is that they have blue eyes as puppies that will change to a yellow color in adulthood. They also have a great sense of smell. During the Cold War, they were used to sniff for missile parts. It is good to train this breed early. They are motivated by treats and positive reinforcement. Loving and affectionate, they are great family dogs. With their short coat, grooming is very easy, mostly needing a bath every few weeks. The Weimaraner was recognized by the American Kennel Club in 1943.